2018 is the Year of Young People. 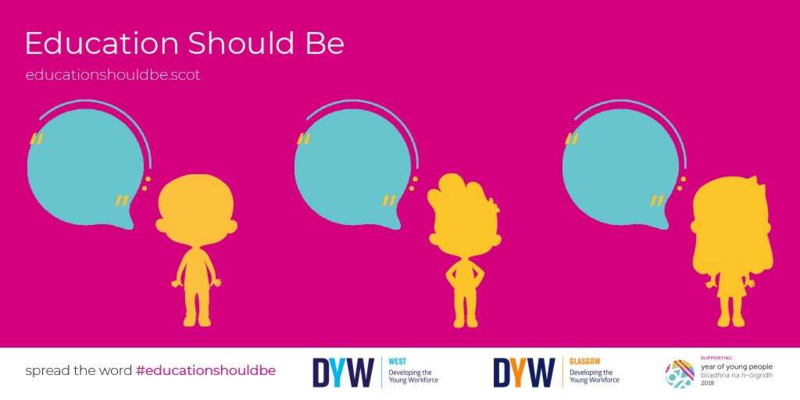 For this, DYW has created a Year of Young People (YoYP) 2018 campaign – ‘Education Should Be…’. Focusing on the YoYP 2018 theme of education, the youngest members of DYW West and DYW Glasgow have teamed up to tackle the YoYP 2018 objective: provide a platform for young people to have their views heard and acted upon. To achieve this, they have developed a Web App that allows young people to share their thoughts on education in Scotland. The tool – which share their thoughts and have their say and takes takes less than five minutes to use – can be found at www.educationshouldbe.scot. You can get behind #educationshouldbe by joining the conversation through social media.